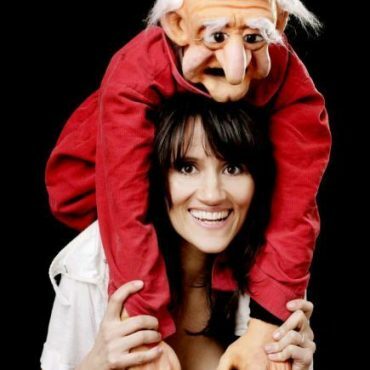 Nina Conti is a Bafta nominated film maker and comedy award winner. Nina Conti started out in stand-up ventriloquism back in 2002, after a short stint as an actress for The Royal Shakespeare Company. Nina and was soon making headlines by winning the BBC New Comedy Award. Famed for her foul-mouthed ‘sidekick’ Monkey , Nina has won numerous other comedy awards for her writing, acting and ventriloquism. Nina has been a regular on our TV screens performing on Sunday Night at the Palladium, The Rob Brydon Show, Russell Howards Good News, and stormed Live at the Apollo. Her playful sophisticated humour and style is a sure -fire big hit for corporate clients. These include Nokia, Deloitte and The Duke of Edinburgh Awards to name a few. Last year Nina toured with her biggest show to date, ‘In Your Face’ all over the UK. I could never be on stage on my own. But puppets can say things that humans can’t say !